Authors: Ron Coté, P.E. and Gregory E. Harrington, P.E. Take the fast track to compliance! The 2012 NFPA 101® Handbook puts practical answers to Code questions at your fingertips so you're ready to apply requirements correctly. The decisions you make on the job affect lives. That's why when a new Life Safety Code® edition comes out, there's no room for error and no time to lose. You need to get up-to-speed fast so you can hit the ground running, comply right the first time, and avoid costly mistakes, violations, and job delays. 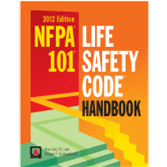 Your best source for the knowledge you need to master new requirements is the 2012 NFPA 101: Life Safety Code Handbook. Code text for new and existing buildings presented side-by-side for easy comparison -- this feature alone makes the Handbook a must! Expert commentary explains the reasoning and intent behind provisions and provide hands-on examples of how to apply rules, including new and revised provisions affecting health care occupancies, high-rise buildings, CO detection and alarms, and elevator use for occupant evacuation. Vertical rules alert you to Code additions and bullets signal deletions, so it's easy to see what's different in this edition. Matrix comparing the 2009 and 2012 NFPA 101 provides an overview of technical/substantive changes at-a-glance. Life safety depends on you. Shorten the learning curve on the new Code and save lives.